1 of 3 In a small bowl, combine olive oil, salt and pepper to taste, lemon juice, orange juice and basil. 2 of 3 Season salmon with salt and pepper to taste. Brush salmon with marinade 1 to 2 hours before grilling, cover in plastic and refrigerate. 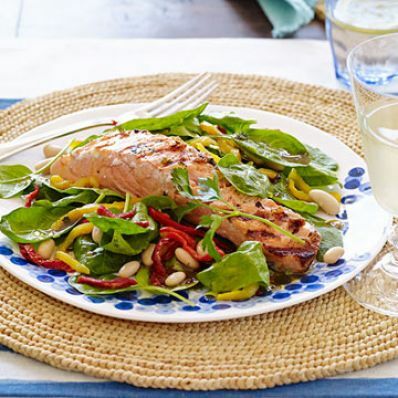 Pat salmon dry before grilling to avoid flare-ups. 3 of 3 Lightly oil the hot grill and grill salmon over very high heat 3 to 4 minutes per side, until browned but inside is medium-rare. 1 of 1 In a medium bowl, combine balsamic vinegar and mustard. Gradually whisk in olive oil, then stir in salt and pepper to taste, shallots and fresh herbs. 2 of 2 Place salmon, hot off the grill, on top of salad and serve.